What projects can I do? Between the ages of 5 and 18 on October 1st. There is a $30.00 per youth enrollment fee for the year. Your club or program may have small dues, or there may be a cost for materials in the program you have chosen. 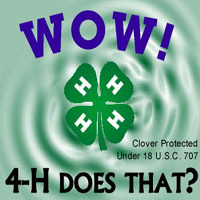 For more information, please review the “Welcome to 4-H“ publication. Community Club: A club is a group of youth who are led by volunteers. Clubs may be a single-project club, where the group only participates in one project area (like only dogs, or only cooking) or multi-project club, where the group participates in many project areas. After School Program: If you’re in an afterschool program, we will work with your program sponsor to begin offering 4-H projects.